Want to know what winning over a million dollars feels like? Ask the boys from the boat Tiger Spirit. 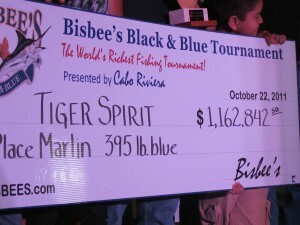 Although their blue marlin was not the biggest in the Bisbeeâ€™s Black & Blue Tournament a couple of weeks ago, we donâ€™t think they are complaining about the 14 lb differential between their blue marlin and the marlin caught by the winners of the tournament, Bad Medicine. Not a bad day at the office for the boat Tiger Spirit. Bad Medicine had a great run at this tournament also, reeling in a 409 lb blue marlin to kick off the first day of fishing netting them $394, 090. The docks of Cabo San Lucas were buzzing with competitors who turned out October 11-15 for the 13th Annual Los Cabos Billfish Tournament. 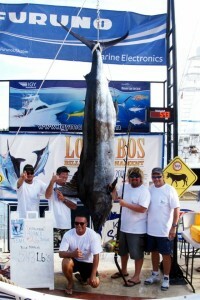 The big winner of this event was Team Chupacabra, who reeled in a 543 pound blue marlin, pictured here. ThereÂ isn’tÂ anything quite like seeing those numbers flash up on the ScaleMaster Scoreboard and knowing you got the big catch of the tournament, right guys? We are sure these numbers got the blood pumping for these fishermen. 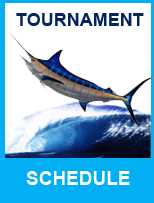 42 boats competed in the tournament, catching and releasing 2 black marlin, seven blue, 16 striped marlin, and 26 sailfish. After a last minute change in venue, the Zane Grey Invitational, the first tournament to kickoff the California Billfish Series presented by Typhoon Polarized Optics, began with a move to Dana Point.Â Â The striped marlin everyone was looking for werenâ€™t biting off Catalina.Â Â The decision was made, and everyone in the tournament agreed, it was the right call.Â Â Sharkâ€™s Parlour was the victor in this tournament, taking close to $80,000 in prize money. 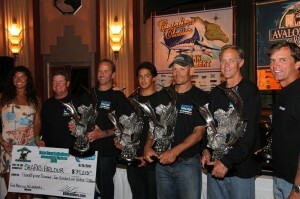 Fishing continued on Catalina Island on September 18-20 with the Catalina Classic and the Avalon Billfish Classic running simultaneously.Â Â Fishing was tough for all of the participants, and with no one landing a fish; a decision had to be made as to what to do with the prize money. Despite the lack of bites, overall the tournaments were successful and the new owners were praised for a job well done. 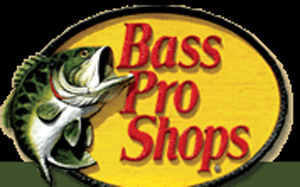 While catch and release is mandatory in the All-Tackle Length program, many anglers are making sure their line class and fly rod record catches swim away healthy too! Mark and Charlotte Sampson of Maryland, USA, are avid shark anglers and together hold 12 light tackle and fly records with shark species alone â€“ many of which have been released alive.Â Realizing that they must protect the species today in order to fish it tomorrow, the Sampsons have used their ingenuity to develop various methods and devices to accurately weigh their record catches and conform to IGFA Regulations. Bahamian boat builder and angler Colin Rose shares the Sampsonsâ€™ sentiment and has perfected a system of landing, weighing and tagging 90+kg (200+lb) tiger sharks that he submits for light tackle line class records.Â He uses a custom-built tripod that supports a certified IWS ScaleMaster II and a heavy-duty cloth harness attached to a pulley system to weigh the fish.Â After the weight and the length/girth measurments are recorded, the shark is tagged and gently lowered and released back into the water.Â The entire process takes no more than a few minutes. Increasing numbers of anglers are getting creative to protect the fish they love to catch,and the Sampsons and Colin Rose are two of many examples of anglers catching fish for records and still successfully practicing catch-and-release.Â To learn about these catches and to check your catch and release ideas with the IGFA before weighing a potential recordfish, please contact Records Coordinator Jack Vitek atÂ 954-924-4246 orÂ jvitek@igfa.org. 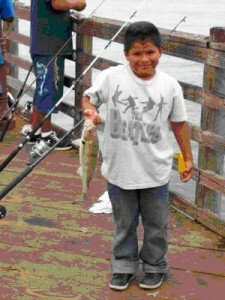 Recent news out of Oceanside, CA says that the junior anglers are eager to get their lines in the water.Â The IGFA 2011 Oceanside Pier Kids’ Fishing Derby, held a couple of weeks ago, entertained entrants ages 6-15, and was nothing short of fantastic.Â Many of us in the fishing community would agree that a Saturday of fishing is probably something we look forward to the most, but these kids do a wonderful job of bringing us back to the pure joy of this sport.Â They provided free equipment and lunch for the 109 entries as well as their parents.Â The IGFA supplied an atmosphere that welcomed many kids who will undoubtedly be a new generation eager to enter the world of fishing.